Campus Reform’s Cabot Phillips took a trip to Alexandria Ocasio-Cortez’s district to ask her supporters what they thought of her Democratic-Socialist agenda. They were all for free stuff, they were just unsure how and who was going to pay for all that free stuff. These clueless individuals think government grows money on trees and that is who will pay for all their free stuff. They don’t even realize that it will be their neighbor who pays for it. Sadly, they don’t even know what conservatism is, except for some ridiculous definition they were provided by a socialist professor or the liberal media. Alexandria Ocasio-Cortez’s supporters seem as ignorant to the facts as she is. All you socialist lovers, how’s it working for the people in Venezuela … how about the donkeys? Ocasio-Cortez gained notoriety nationwide not just for her youth, but for her unabashed embrace of Democratic Socialism. In her official platform, Ocasio-Cortez offers support for free college, “housing as a human right”, “medicare for all,” and a mandatory minimum living wage. Wanting to know if her supporters liked the idea of Democratic Socialism, and if they’d support the government offering these services for free, I headed to Ocasio-Cortez’s district, in Astoria, NY. “Oh, God… Us, I guess,” conceded another. Hmm, Donald Trump is President, their is a Republican controlled House Republican controlled Senate, the economy is booming once Trump was elected and allowed capitalist principles to take over and some how self-proclaimed socialist Bernie Sanders says his socialist ideas are winning. Two takes from Bernie’s interview with Chris Cuomo, one is a total joke, but the others should frighten old time Democrats. When Cuome asked, “Why aren’t you doing better, You had a lot of guys lose. I don’t think you’re even at 500.” The socialist Sanders actually had the audacity to say, “Chris, that is in all due respect not an intelligent way to look at it.” HUH? So actually winning a political election isn’t an intelligent way of gauging whether you are winning. Alrighty then. I guess Bernie thinks participation trophies are winning. However, this is the comment that should push all blue collar, hard working middle class Democrats to vote Republican and Trump … “Do you think that — you know a little bit about politics. Do you think in a year or two suddenly we transform the entire Democratic Party.” Attention blue collar Democrats, this dude and progressives want to transform the Democrat party to the Socialist party. Of course one might ask the Socialist Sanders why he isn’t supporting or endorsing his own son in his Congressional race in New Hampshire. 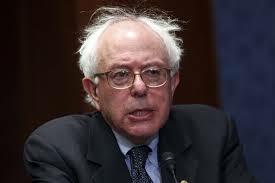 As reported at The Hill, socialist Sen. Bernie Sanders of The People’s Republic of Vermont has announced a federal jobs proposal that would guarantee a job with at least a $15-per-hour wage and health benefits to every adult American “who wants or needs one.” UNREAL, just how would we pay for this socialist program? NOW? Jobs under the Trump administration are being created hand over fist. Capitalism seems to be working just fine. Fourteen states have recorded record low unemployment in the past year which begs the question, why would individuals need the government for a job, except to be kept dependent? If Americans want to work, they just need apply. But what else would one expect from a socialist but making individuals dependent upon government. The senator is still in the early stages of crafting the plan, according to the Post, which would provide a job or required training for any American. Sanders’s office has yet to release the details of the plan’s funding, but previous large-scale projects proposed by the Vermont progressive have involved ending tax breaks for the wealthiest Americans and large corporations. The Vermont senator joins two other possible 2020 contenders, Sens. Kirsten Gillibrand (D-N.Y.) and Cory Booker (D-N.J.), who have also expressed support for similar proposals in recent weeks. “The goal is to eliminate working poverty and involuntary unemployment altogether,” Darrick Hamilton, an economist at The New School, told the Post. Maybe Bernie and his socialist friends might want to take a look at the failed Finland experiment … Finland’s basic income trial falls flat. This is what socialism looks like, failure. The Finnish government has decided not to expand a limited trial in paying people a basic income, which has drawn much international interest. Currently 2,000 unemployed Finns are receiving a flat monthly payment of €560 (£490; $685) as basic income. “The eagerness of the government is evaporating. They rejected extra funding [for it],” said Olli Kangas, one of the experiment’s designers. Some see basic income as a way to get unemployed people into temporary jobs. The argument is that, if paid universally, basic income would provide a guaranteed safety net. That would help to address insecurities associated with the “gig” economy, where workers do not have staff contracts. Supporters say basic income would boost mobility in the labour market as people would still have an income between jobs. Finland’s two-year pilot scheme started in January 2017, making it the first European country to test an unconditional basic income. The 2,000 participants – all unemployed – were chosen randomly. But it will not be extended after this year, as the government is now examining other schemes for reforming the Finnish social security system. Just how bad of a presidential candidate is Hillary Clinton for the Democrats? It has finally happened, the most recent Franklin Pierce poll shows that self-proclaimed socialist Bernie Sanders now leads Hillary Clinton by 7 percentage points, 44% to 37%. ARE YOU KIDDING? Hillary Clinton is considered by all as the presumptive Democrat nominee to run for president in 2016, but yet she finds herself behind in a poll to a socialist. Is it Hillary’s lack of trustworthiness not much of an issue? However, since when have Democrats cared about their presidents or candidates telling the truth, aka you can keep your doctors, if you like your doctor promise of Obamacare. Or has this email/private server scandal just pushed people from holding their nose when it comes to Clinton, to abandoning her? What would happen if Hillary Clinton actually had a viable competitor in the primaries, rather than a socialist like Sanders? Then again, no one can tell the difference anymore between the Socialist and Democrat parties these days. Democratic presidential hopeful Bernie Sanders has rocketed past longtime front-runner Hillary Clinton in New Hampshire, a stunning turn in a race once considered a lock for the former secretary of state, a new Franklin Pierce University/Boston Herald poll shows. Sanders leads Clinton 44-37 percent among likely Democratic primary voters, the first time the heavily favored Clinton has trailed in the 2016 primary campaign, according to the poll of 442 Granite-Staters. Vice President Joe Biden got 9 percent support in the test primary match-up. The other announced Democrats in the race, former Maryland Gov. Martin O’Malley, former Rhode Island Gov. Lincoln Chafee and former Virginia Gov. Jim Webb, barely register at 1 percent or below. The live interview phone poll was conducted Aug. 7-10 and has a margin of error of plus or minus 4.7 percentage points. Clinton is still viewed overwhelmingly by voters as the likely Democratic nominee, but the results suggest she faces an unexpectedly difficult fight to prevent an embarrassing opening loss in the first-in-the-nation primary. Vermont’s self-proclaimed socialist Senator is supposed to announce his candidacy for the 2016 presidential election. I can say that I do not agree with one position or policy of Sanders but I do respect him because as far-LEFT and socialist as he is, he actually believes what he says, as misguided as it is. For that I say, run Bernie, run!!! We speculated a month back when Bernie Sanders hinted that he would run in 2016, that he might just be Hillary Clinton’s worst nightmare. Although Sanders is an Independent in the Senate, he would be running in the Democrat primary. Sanders would force Hillary to the far, far LEFT. The Democrat party has moved much farther to the LEFT from the days of Bill Clinton’s presidency. Does Bernie have a real chance of winning the Democrat nomination, probably not. However, this socialist who is going to run on income inequality has strongly criticized Clinton for having a “soft” attitude towards Wall Street. Sanders could be a major thorn in the side of Hillary Clinton as his socialist views are loved by the liberal base. The Independent Socialist Senator said he “liked Hilliary” and she is a “very, very intelligent person”. However, Sanders said there needs to be a leader “to wage a political revolution in this country which brings millions of people into the political process to stand up and fighting for their rights in a way that we have not seen right now,” and Hillary Clinton was not the leader of that movement. VPR News has learned from several sources that Independent U.S. Sen. Bernie Sanders will announce his candidacy for the Democratic presidential nomination on Thursday. Sanders will release a short statement on that day and then hold a major campaign kickoff in Vermont in several weeks. Sanders’ entry into the Democratic race ensures that Hillary Clinton will face a challenge to win the support of the liberal wing of the party. Sanders’ basic message will be that the middle class in America has been decimated in the past two decades while wealthy people and corporations have flourished. His opposition to a proposed Trans-Pacific Partnership trade deal (T.P.P.) shows how he plans to frame this key issue of his campaign. In the Real Clear Politics Poll for the 2016 Democratic Presidential Nomination has Bernie Sanders in a distant 4th place at 5.6%, some 56.6% behind Hillary Clinton; however, ahead of O’Malley, who the media claims to be a challenger to Hillary.